The 1960s “spy craze” was more of an explosion -- once James Bond became a phenomenon, movie and TV producers went after everything that remotely resembled an espionage adventure. 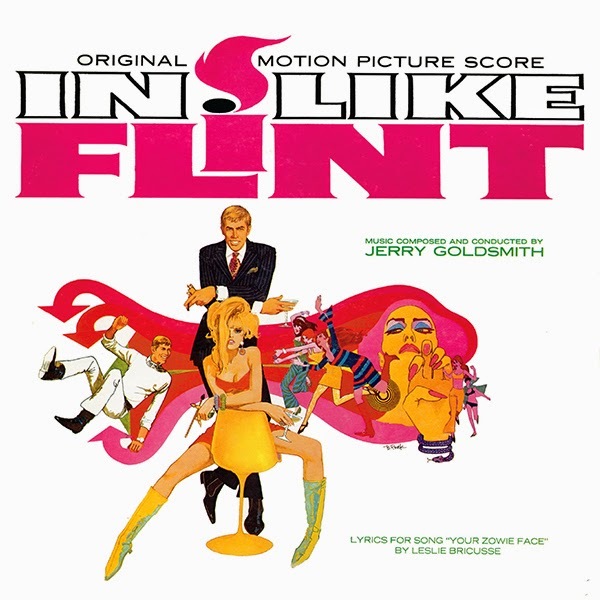 Composer Jerry Goldsmith played his part with the two-film Derek Flint series Our Man Flint and In Like Flint, combining his own rhythmically driven, cutting-edge action score riffs with performances by a super team of session musicians. The sounds, the colors, the tunes, the excitement…all were dynamically re-recorded by Goldsmith in vibrant stereo for the 20th Century-Fox label back in 1966 and 1967 respectively. The importance of the original albums for Our Man Flint and In Like Flint is difficult to overemphasize. Both albums found the composer soaring with a vernacular previously unheard, a propulsive display of global action, romance, infectious melody, nefarious happenings and super-agent heroics in kind…from the blasts of alto and tenor sax to the ringing of organ and echoing solovox, from the melodious touch of accordion to the power of a full orchestra, Jerry Goldsmith went where no composer had gone before. And enhancing both albums were now iconic covers sporting terrific Bob Peak artwork. Both of these scores have been mastered from the original elements prepared by the composer and his engineers back in the days, recorded directly onto ½” three-channel tape and mixed directly from those session tapes to create the final stereo record masters. These original master tapes, vaulted by UMG, have survived in beautiful condition and afford today’s listeners with modest improvements in the stereo imaging, especially in the center-channel information. In Our Man Flint, when a madman named Malcolm Rodney (Edward Mulhare) threatens the planet with devastating weather phenomena from a secret island base, Flint infiltrates the villain’s island after a series of international adventures, Flint rescues his own foursome of gorgeous mistresses and a bevy of similarly brainwashed female victims from a futuristic, hedonistic, secret society cooked up by Rodney and a group of scientists determined to save humanity from itself. In his second outing in In Like Flint, Flint faces the most terrifying threat of all—an army of women determined to take over the world, starting with the replacement of the President (Andrew Duggan) with an impostor. Awesome announcement and I'm sure there are many bongos.